There is an industrial building with a 480V open delta service. Is it common to run 3 phase, without an Equipment ground? I had an electrical engineer tell me the equipment ground is not needed because if a leg hits ground, it would not trip the breaker until a second phase also grounds out. The situation is a cable tray with just the 3 phase conductors in it, and then conduit will be ran to a 200 amp disconnect. The NEC wants us to run equipment grounds in all systems, right? Is it a poor design, not to have an Equipment ground? The EE needs to be reminded that he's not an electrician, and that the NEC is not in the college curriculum. For nearly any circuit (power cords to double-insulated tools being the only exception I can think of), we need a ground or fault path. Things still need to be bonded together. For a branch circuit, the conduit can be the fault path. For a feeder or service, you need a wire. Otherwise, you have the possibility of one piece of equipment becoming energized by 'phase A' and another being energized by 'phase B." Without bonding, this double fault will exist untol the two pieces are connected - maybe by you. Who want's to be nicnamed "Fuseboy?" BTW, you have an 'ungrounded Delta.' An 'open Delta' is a three-phase system with only two transformers. Yes, it is possible to have an ungrounded, open Delta system. Are you talking about "open" as in 2 transformers or "ungrounded" delta. 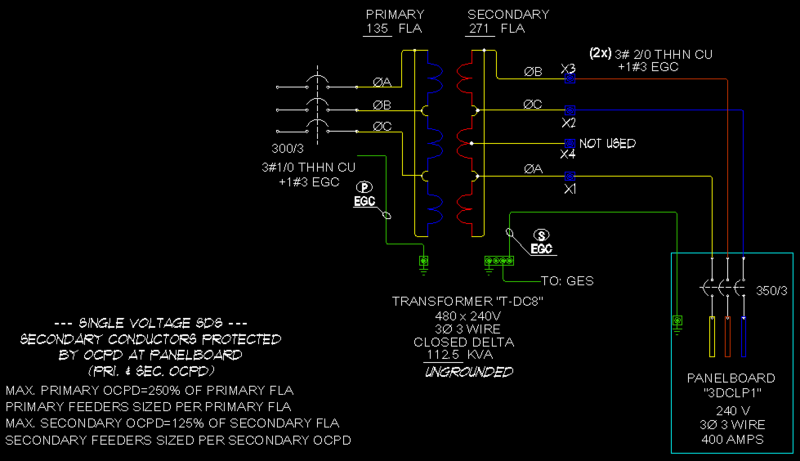 Even in ungrounded delta you need the EGC connecting to ground and bonding all non-current carrying conductive materials. (1) Grounding Electrical Equipment. Non�current-carrying conductive materials enclosing electrical conductors or equipment, or forming part of such equipment, shall be connected to earth in a manner that will limit the voltage imposed by lightning or unintentional contact with higher-voltage lines and limit the voltage to ground on these materials. (2) Bonding of Electrical Equipment. Non�current-carrying conductive materials enclosing electrical conductors or equipment, or forming part of such equipment, shall be connected together and to the supply system grounded equipment in a manner that creates a low-impedance path for ground-fault current that is capable of carrying the maximum fault current likely to be imposed on it. This is an ungrounded Delta. The source (Distribution Panel) is approx. 200' away. 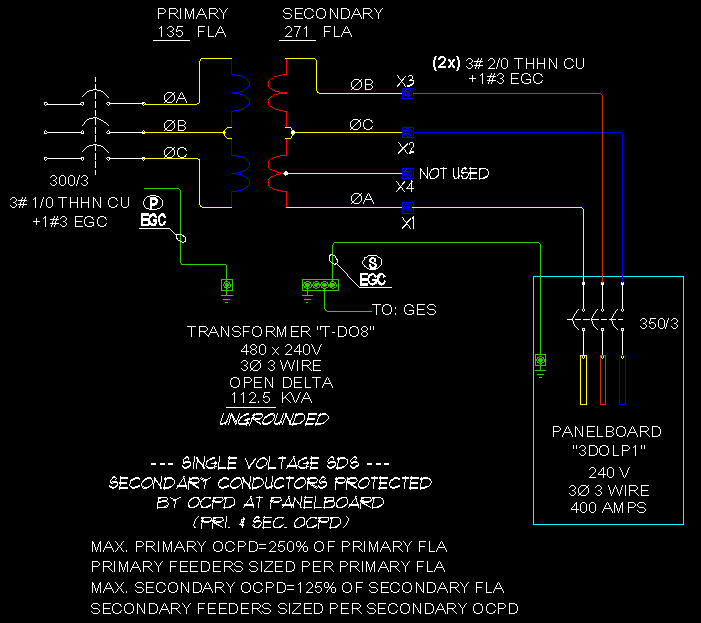 From that, they ran 3 - 4/0's ungrounded conductors, 480v and no equipment ground in a tray that is bonded to Bldg. steel. These were ran to a small Bldg. that will be removed. They want to splice the conductors in the cable tray and continue them to another small Bldg. In the Bldg. there will be a trough and 2 disconnects that will be mounted. This would be considered a feeder to the Bldg. and not a service. There is a grounding electrode at the Bldg. steel. Would it be to code, if I were to run a #4 from the new disconnects to the Bldg. steel, to create an equipment ground? Or must I run a #4 back into the tray and back to the source with the feeders, (200'away)which they should have done from the get-go. Could it be a Corner grounded delta? I suppose as long as you are connected to the grounding electrode (building steel) you have complied with 250.4 as long as the building steel is continuously bonded together. Just for fun... here are some of the many, many, many Flavors for Delta Configurations!!! Figure #1-1: 3 Phase 3 Wire Open Delta "VEE" - Center Tap Grounded. 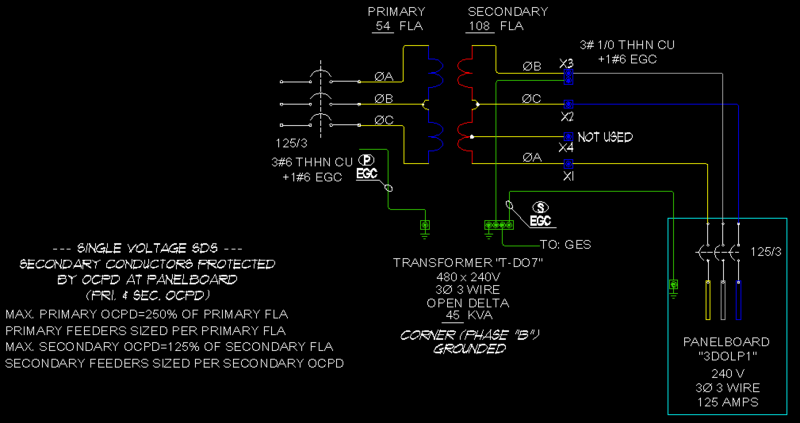 Figure #1-2: 3 Phase 3 Wire Open Delta "VEE" - Corner Grounded (Phase "B"). 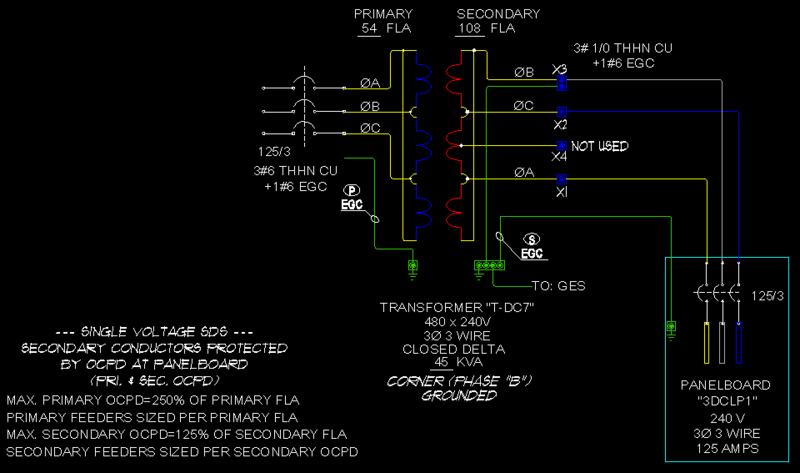 Figure #1-3: 3 Phase 3 Wire Open Delta "VEE" - Ungrounded. Figure #2-1: 3 Phase 3 Wire Closed Delta - Center Tap Grounded. Figure #2-2: 3 Phase 3 Wire Closed Delta - Corner Grounded (Phase "B"). 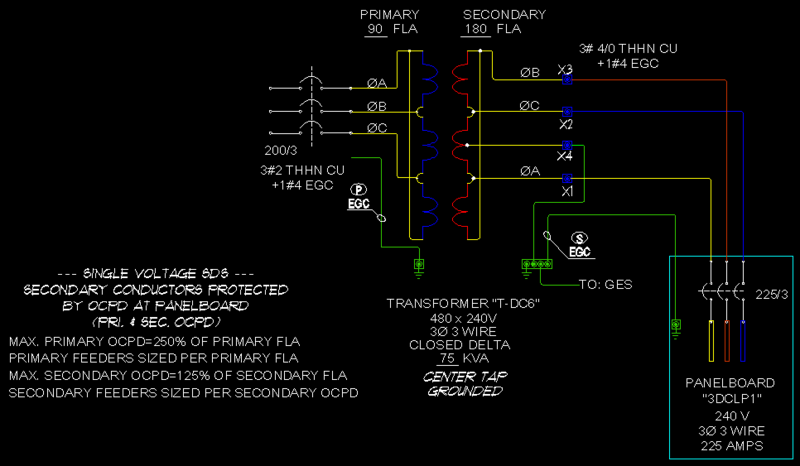 Figure #2-3: 3 Phase 3 Wire Closed Delta - Ungrounded. Each of these systems needs the Metallic Equipment bonded to a Grounding Electrode System - including the Ungrounded version. I had an electrical engineer tell me the equipment ground is not needed because if a leg hits ground, it would not trip the breaker until a second phase also grounds out. "Not Needing an Equipment Grounding Conductor"
4: If / When one of the remaining Two Phase Lines becomes Ground Faulted (2nd L-G Fault), an Overcurrent will occur - hopefully causing the Overcurrent Protection Device (OCPD) for that Branch Circuit or Feeder to trip. 5: Ground Fault issue is now a Production issue also! Grounded and Ungrounded Deltas may be either Closed (3 Transformers), or Open (2 Transformers). "Tee" typical 3 Phase 3 Wire dry type Transformer for 50 KVA and less capacities; very common for 3 Phase to 2 Phase Conversions. Both Grounded and Ungrounded Delta Systems require the Metallic Enclosures / Raceways to be Bonded to a local Grounding Electrode System (GES). 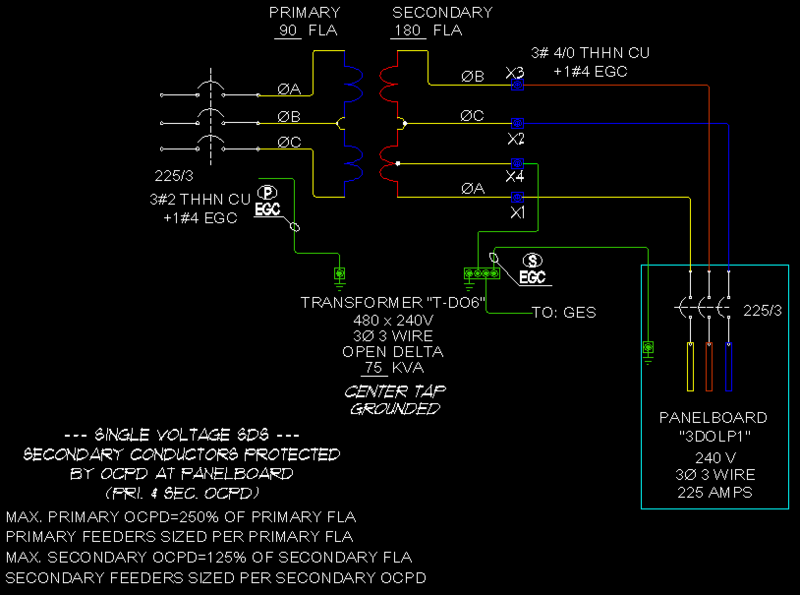 1: Take your High Z Input Volt Meter (AKA "Fluke DVM"), and your Low input Z Volt Meter (AKA "Wiggy" / Solenoid type Volt Meter) with you when returning to this Project. 2: Go to an accessible point on the Ungrounded System - as far from the Service as possible; something like a Disconnect Switch that may be Live tested safely. 3: Place the High input Z Meter on the Highest AC Voltage Scale. 4: Measure the Voltage between One of the Phase Lines and the Metallic Enclosures / Conduits (Raceways). Make sure the Metallic Equipment is Bonded to Earth Ground in some way (hopefully via an Equipment Grounding Conductor). 5: Measure the L-G Voltage between the remaining Two Phase Lines and Eq. Ground. 6: Measure the L-L Voltage between any Two Phase Lines. 7: Now measure L-G Voltage with the Low input Z Volt Meter. 8: Come Home, log in to ECN, pull up this thread, and tell us what the readings were! p.s. "Z" = Impedance i.e. : Low input Impedance, High input Impedance. Any updates per this Topic?? ?